Formed in 2007, after meeting homeless Irish twins John and Shelly in Berlin, this band has come a long way. 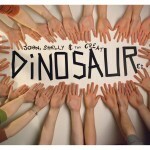 Their album Dinosaur was released in March this year, and PopCultureMonster got a listen to it this week. This album is full of driving songs: crank this up if you’re driving somewhere, windows down on a warm day and it will be pure bliss. The album reminds me of early Neil Young and is definitely going on the aul iPod this year. A sound for Summer 2010 for sure. Sunny Side Street is unusual in the sense of the changing time signatures and contradicting rhythms, but works really well. There’s an Elliot Smith or Coldplay-esque sensibility to the vocals which seem gruff at times, but are certainly not jarring to the listener. The album does err on the side of tame at times, but redeems itself overall. The catchy, pop-rock tunes Rust and Killer show that the guys can write really good upbeat tracks. On first listen the songs are all so different and yet they complement each other perfectly, which is probably due to extensive instrumentation, stellar lyrics and those husky vocals. The album flows through each of the tracks effortlessly, and before you know it it’s over and you’re hitting repeat. It’s difficult to pick the highlights of this album, but if I had to choose it would be Blinded + Cross, Killer, Heavyweight and Fools. I also must address the album art throughout. It is one of the best covers I’ve seen in a long time. Simple and fun, and the picture inside shows that the band is a little bit quirky, enough to be cool shall we say. A very solid debut from the Northerners, which definitely shows that they deserve the hype surrounding them, and are rising stars from the Irish music scene. They’re folksy and atmospheric, yet catchy and definitely here to stay. Oh yeah, they’re also the band who have the song on the Discover Ireland ads. Marina and the Diamonds - the fall?